Treesolution: For information on the plan and download book click here. There is a cheap, affordable, solution that creates wealth while solving the CO₂ problem. Groasis calls it ‘The Treesolution’. In 2008 Pieter Hoff, Groasis’ founder, wrote a book about this solution and since then his company Groasis continued to work on making implementation of the solution as cheap as possible. The Treesolution can save us from climate change at less than half the cost of the bank bail out that followed the 2008 crisis. The tree is a wonderful creation that enables us to solve the climate change challenge. Where man invented CCS – Carbon Capture and Storage, more on this later – to capture and dump CO₂ (as mankind is accustomed to do with waste) our nature breaks down the CO₂ molecule and creates 2 useful materials: carbon and oxygen – through a process called photosynthesis. Trees extract an average of 15 tons of CO₂ per hectare per year from the atmosphere and decompose the molecule. Trees are the only affordable and scalable solution available to humanity to reduce the CO₂ concentration in the atmosphere. The Netherlands currently produce 163 million tonnes of CO₂ per year, so if they plant 12 million hectares of trees by the year 2030, by then those trees will remove all annual CO₂ emissions from the Netherlands from the atmosphere. Twelve million hectares is an area of ​​less than 3 times the size of the Netherlands. Within 10 years the Netherlands can be 100% CO₂ neutral – if they want to. Every country in the world can copy and paste this affordable method. 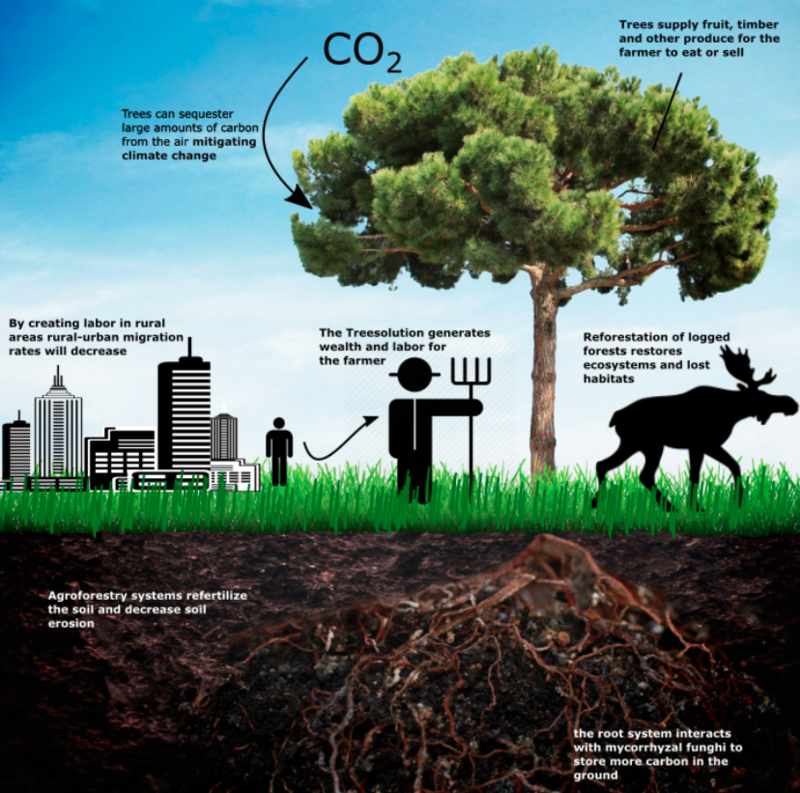 Neutralising CO₂ emissions by planting trees on degraded land is what I call ‘The Treesolution’. By doing it on degraded land, we do not use fertile soil – which can be used to sow food crops. As the word says, trees are the solution. It is an effective, simple and affordable tool that can support the expensive Dutch Climate Agreement. The proposed Climate Agreement would cost the country 20 to 25 billion euros per year for around 30 years, according to the Netherlands Environmental Assessment Agency (PBL). The Treesolution requires a one-time investment of 25 billion (spread over ten years) but will then generate income to recover the investment. It does not cost money, but makes money. Moreover, we make the earth green again. The Treesolution is like a game without losses. It requires a an investment of 25 billion over ten years: 2.5 billion per year – instead of 20 to 25 billion per year that the current proposed Climate Agreement of The Netherlands will cost. We plant a total of 12 million hectares of trees on degraded land. These new forests neutralize 100% of the 163 million tonnes of annual CO₂ emissions of The Netherlands – instead of just 49% CO₂ per 2030 as per the proposed costly measures. If the other climate measures start to take effect in 2030 and the annual CO₂ emissions of the Netherlands fall to a lower level, then the trees will not only extract the annual CO₂ emissions from the atmosphere, but also start to decompose the historical emissions of the Netherlands. The Netherlands can thus become retroactively CO₂ neutral. After 12 years, the 12 million hectares will produce – on an annual basis – approximately 60 billion kilos (5,000 kilos per hectare) of fruit or other food. With an assumed value of 0.30 euros per kilo, this represents annual revenues of 18 billion euros – thus recouping the original investment of 25 billion euros rather quickly. After 50 years, the degraded soil is fertile again due to the humus production from the CO₂ decomposition. Mankind can now plant seeds and vegetables on the fertile soil, in the shade of the trees. This is how we produce food for millions of people. This is how we create jobs for millions of people. This is how we generate an income for millions of people. With the Treesolution we prevent climate change – based on a prosperity-creating solution that costs no money but generates money. I propose to add the Treesolution as a tool to the Dutch Climate Agreement and to go for net 0% CO₂ emissions by the year 2030. Neither space nor implementation is a problem. If you continue to follow these blogs, you will see how this solution can easily be implemented. One problem, however, are some of the measures that are being taken to ‘counteract’ climate change. This is discussed in the following blogs. The title of my next blog is ‘ The wind turbine’. I have asked two famous young Dutch scientists to check the viability of the Treesolution. You can download their paper here. Copyright © 2019 – Groasis B.V. All rights reserved. We give you permission to publish the blogs in whole or in part with the addition of © Groasis. All blogs are also sent to the general public via the channels of Groasis. You as a journalist receive the blogs 2 days earlier. Do you want to change your preferences or unsubscribe yourself from this list? You can change your preferences here or unsubscribe yourself from this list.